‘No gore, no glory’ would seem to be the motto for the former Massacre growler Kam Lee these days. The grand old voice of death metal has returned with another fruitful collaboration with Swedish Rogga Johansson (among others Paganizer/Ribspreader/ex-Edge of Sanity). The Bone Gnawer project released their Thomas Nielsen approved debut ‘Feast of the Flesh’ earlier this year, but this new release, under yet a new moniker, is even better and more grim. 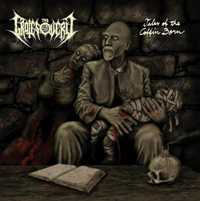 ‘Tales of the Coffin Born’ takes you into a Lovecraftian world of gloom and necromantic gore, the concept revolving around a story of a man who kills a new victim every year in order to allow his son to live, each song accompanied and tied together by a little spiel to get the story going. The style is 90s death metal the way I can only appreciate it. Technically impeccable, and above and beyond all groovy as hell. Check out a track like Necromantic Ways – this is monster groove! Recommended for fans of Bolt-Thrower and Cannibal Corpse. Deadly stuff!